My goal is to provide exceptional care that will allow my patients to return to the activities they love. Dr. Grayson received his fellowship training in adult reconstruction at Indiana University Health, and is board certified by the American Board of Orthopaedic Surgery. He is a member of the American Academy of Orthopedic Surgeons and American Association of Hip and Knee Surgeons as well as a member of the International Congress of Joint Reconstruction, and the Florida Orthopedic Society. He focuses on robotic hip and knee replacement, partial knee replacement, revision hip and knee replacement, and taking care of patients with infected joint replacement. Dr. Grayson is the author multiple articles in peer reviewed journals, including the Journal of Arthroplasty and PM&R, a peer-reviewed scientific journal of the American Academy of Physical Medicine and Rehabilitation. He has presented his research at the American Association of Hip and Knee surgeons, Florida Orthopedic Society, University of Florida, the University of Indiana and the Alachua County Medical Society. He was also named an emerging leader in orthopedic surgery by the Florida Orthopedic Society. Dr. Grayson grew up in South Louisiana and obtained his undergraduate degree in biological science at Louisiana State University (LSU). During his time there, he worked as an assistant to the LSU football team orthopedic surgeon, conducted research, and developed a love for Louisiana cooking. 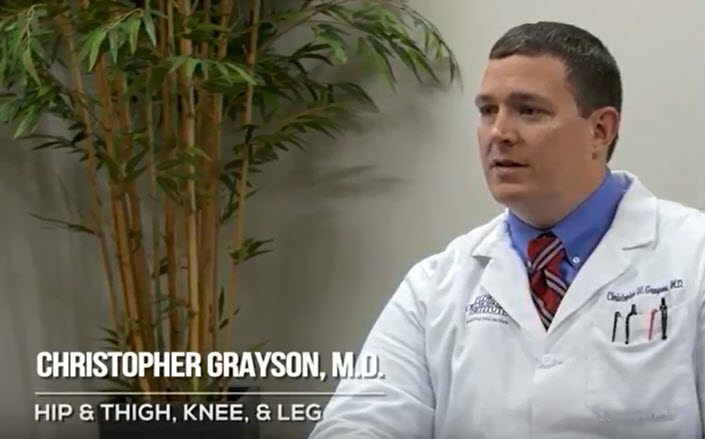 While obtaining his degree, Dr. Grayson developed his passion for joint replacements after his father had both knees replaced. In his spare time, Dr. Grayson enjoys spending time with his family, traveling and cooking. All I can say is that I was completely satisfied with my hip replacement. He is informative, compassionate and, most of all, an excellent surgeon. My hip was so painful that I struggled to walk any distance without a cane. If I accompanied our family and grandchildren to Disney World, someone had to push me in a wheelchair. Dr. Grayson told me that I was a good candidate for a total hip replacement. He was so right. I had the replacement done in April 2017 and could not be happier. Today, I can walk anywhere I like without a cane. We went to Disney and Epcot last year and walked over five miles in one day without a cane or wheelchair. I had my two year follow up visit with Dr. Grayson at the Citrus Park facility. X-rays show that everything is in place exactly where it should be. I am so thankful and happy that I chose Dr. Grayson for my surgery. He gave me my life back. As a snowbird in Florida, I was experiencing leg pain and thought it was a shin splint. I chose Dr. Grayson because he was listed as treating sports injuries. Dr. Grayson took an x-ray, examined my leg and thought it may be a muscle strain. I was prescribed an anti-inflammatory for two weeks. I feel that Dr. Grayson went the extra mile as he also sent me for an ultrasound to make sure I did not have a blood clot. Nothing was found and in two weeks, my leg pain was no better. Dr. Grayson sent me for an ABI test and that when when we found that I had PAD. I am now being referred to a vascular surgeon. I am thankful that Dr. Grayson did not just think about orthopedics. He also thought outside the box to find out why I was having leg pain. Thank you, Dr. Grayson! My first procedure was successful. I had a knee revision. Dr. Grayson was the fourth doctor I had visited. He was highly recommended by another orthopedic surgeon. During my first visit, he diagnosed my problem. As a result of my surgery, I am completely pain free. I also have bursitis in each hip. I did not need surgery for that. He suggested physical therapy. I was hesitant. Now, I am following his suggestions and going to PT, along with injections in each hip. Thank you for your patience with me. I am pain free. Dr. Grayson is awesome! I finally found an orthopedist that took the time to really explain what I wanted to know concerning my total knee replacement. I became a major fan of Florida Orthopaedic Institute because of the professional standards they maintain as well as the compassion and patience. Dr. Grayson made sure that I fully understood the procedure. I would highly recommend him to anyone that is looking for an orthopedic surgeon. Dr. Grayson performed a total hip replacement surgery on me and literally gave me my life back. Horrible bone on bone pain had ended my days on the golf course, walking, sitting and standing. Pain can rob you of the activities you enjoy doing. Prior to surgery, my pain level was eight to nine. Following surgery, I couldn’t believe it was only one to two. And even then, it was just surgical soreness. I began walking with a walker that afternoon and by week two, it was with a cane. Thank you Dr. Grayson! You are the best! It has been three months since I had my hip replacement surgery and what a difference this has made in my life. I am walking daily and loving it. If you are reading this, you are probably in pain or have lost your mobility. Your quality of life may have deteriorated and you just want your life back. This was my experience before my surgery and I knew that I had to do something. My experience with Dr. Grayson and his staff has been very positive. He explained my condition and made sure I understood why surgery was being recommended. He wanted me to be comfortable moving forward. He listened to me and took time to answer all of my questions. His staff is helpful and courteous. If you are considering hip or knee replacement surgery, I highly recommend Dr. Grayson. I believe you will be very happy with your decision. I had, unfortunately, hurt my knee at work and, being new to Florida, I didn’t have any doctors. I was sent here and, boy, am I glad I was. Dr. Grayson and his staff are simply amazing. They made a very difficult time better. Very friendly and kind. I would recommend this practice to anyone. Keep up the good work. Thank you. I could not believe how quickly I recovered from my first hip replacement 20 months ago. I was in excruciating pain before surgery and awoke after surgery pain free. I was back to full activity in eight weeks. I just had my second hip replacement and recovery was even faster due to the use of new robotic techniques. He is not only a talented surgeon, but he is attentive to patient needs and has a friendly and caring staff who go above and beyond to assist with scheduling or insurance needs. Truly an amazing job. I would recommend Dr. Grayson. I am pain free. Thanks! Dr. Grayson is an excellent surgeon. He is professional, friendly and explains procedures thoroughly in an easy to understand manner. Christine is very efficient and quick to follow up on all phone calls and questions. All the staff at the FOI Citrus Park was very friendly, professional and thorough. Recommend the facility highly. I was looking for a surgeon who would perform a hip replacement. Dr. Christopher Grayson listened to me to what was happening to me. I had been in pain for over a year and a half and really needed help. From the time i met him I knew he would help me. It was all an amazing journey from start to finish. Dr. Grayson is awesome. There are just no other words. Dr. Grayson, you are the best and I will tell anyone that they should go to you for their needs. I am always in your debt. Dr. Grayson and his MA are excellent to deal with and very helpful with filling out required medical documentation for my employer and insurance company. Dr. Grayson saved my leg and, for that, I am very grateful. The physician was very knowledgeable and answered all of my questions. I was very happy with the doctor and comfortable with him doing my surgery. Dr. Grayson is awesome and really cares about his patients. Such a nice person and his staff is excellent! Dr. Grayson is very caring and professional. I hesitated to do this review because, selfishly, I do not want too many other people to discover him. That may make it harder to see him. Nonetheless, I highly recommend Dr. Grayson and will always be grateful to him for his knowledge and care. The staff is ALWAYS helpful and courteous. Dr. Grayson’s assistant Christina is very knowledgeable and prompt in answering questions or concerns. I would highly recommend Dr. Grayson to anyone in need of a good doctor. Dr. Grayson just replaced my mom’s knee only 3 days ago. I am a RN and was blown away at the wonderful care she received from Dr. Grayson and the staff. They are truly remarkable. Every single staff member has been nothing but kind and professional. We highly recommend Dr. Grayson. Before finding Florida Orthopaedic Institute I went to several doctors trying to get relief from the extreme pain I had in my hip. I saw Dr. Maxson first. He took one look at my x- ray and told me I needed an expert for this, because I have an allergy to metal in my bones. Two minuets later in came Dr. Grayson. He took one look at the x-ray and said “you need surgery”. Christina B., Dr. Grayson’s administrative medical assistant took my info and had me in the hospital two weeks later. I went in [very impressed by their procedure for prepping prior to surgery] on Tuesday and was back home Thursday, able to walk again. I had virtually no pain, was advised to use a walker. I did for about a week until I got my balance back. Now I am back to riding my bike 20 miles, golfing, swimming and enjoying life. Anyone that has a joint related problem needs to see these doctors. They are wonderful. THANK YOU! After three surgeries with another doctor, serious infection, and a badly placed spacer, I was dropped by my doctor. His reason was that I was to great of a risk. For nine months I had been in constant pain laying in a bed in a rehab. I found Dr. Grayson and he told me that if I did everything he told me to do I would be fine. After my surgery with Dr. Grayson I had no pain and with therapy I walked for the first time in nine months. He is a wonderful, kind, and caring man who is an extremely knowledgeable, competent and skilled surgeon. I would recommend him to anyone who needs hip surgery without hesitation. I was in severe pain in both hips for 5 years. I talked to Dr. Grayson and he said he could help. I had my first hip done on June 5th, 2017 and had my second hip done Nov. 2017. WOW! What a difference! My rehab was 3 home sessions and recovery was 10 days. Dr. Grayson was very professional and caring. I highly suggest Dr. Grayson to give you back your quality of life and then some. Thank you, Dr. Grayson for giving me my mobility back! I had just completed a move to Florida from Michigan and was experiencing pain in my right hip and difficulty walking. Because I’d had 4 prior orthopaedic surgeries in Michigan, I was quite upset finding out I’d needed another hip replacement to end the pain. Dr. Grayson assured me that while I’d experienced problems before, and had my last hip replacement 6 years ago, he thought I’d be pleased with the advancements made since then. He did my surgery on Dec. 11,2017. I spent 3 nights in the hospital and went home alone. I was able to care for myself without help. I used a walker for the first week. I had home care nurses 3 times a week and also a therapist 3 times a week. I walked without a cane around my condo in my second week. I walked into my appointment with Dr. Grayson at 16 days post-op without a cane. To ring in the New Year I drove my friend and myself to the casino where I walked around on my own with no pain and able to stay several hours. What a Happy New Year for a 71 year old widow. I will do some out patient therapy now to regain better body strength and because I want Dr. Grayson to look at my other hip which though replaced twice in Michigan has never been right. He and his staff are an answer to prayer for finding a new area doctor who can help to keep me moving and active. I was very impressed with Dr. Grayson and his staff. Everything was very professional and friendly. The staff at the Physical Therapy was the same way and that’s very important to my recovery. After 10 weeks I was playing golf and walking 18 holes with no pain. My life is now back to normal and I can do anything I want. Dr. Grayson performed a total hip replacement for me. I highly recommend him as he is highly skilled. I found him to be very patient, thorough in explaining what needed to be done, and what to expect post-surgery. Office visits were prompt, and Dr. Grayson explained my problems and how he would fix me up to have a very normal life without pain. After operation he came to hospital each day giving me support in my healing! Dr. Grayson is an easy man to talk to and very accommodating. My surgery was scheduled quickly and my hospital stay was fast and comfortable. The staff was wonderful! I am in my fourth week of recovery and doing great. Thank you, Dr. Grayson and all your staff! Dr. Grayson listened as I described the issues I was having related to a 5k run after not having run in 10 years. I could hardly walk when I got to the office. He checked me out, made a diagnosis, and had me walking again in 30 minutes. He thoroughly described my injury and how to treat it for a week and conducted a follow up just to insure my quality of health. My experience with having a total knee replacement was stellar! Dr. Grayson is a skilled orthopaedic surgeon that I give the highest rating to of any physician I have experienced. He has a pleasant personality that any patient would feel comfortable with. I’ve heard horror stories of knee replacements in the past from friend’s experiences, but that was not my experience at all. There was no pain whatsoever. The home therapy as well as outpatient therapy at Dr. Grayson’s facility was nothing but superb. As soon as you wake up from the surgery you’re walking and will go home the next day! I was using a walker for a week, a cane for three days after that, and riding my bike again in four weeks post-surgery. Several of my friends have taken my recommendation to have their knee surgery with Dr. Grayson and have had the same wonderful experience! Dr. Grayson is an excellent doctor. He is very informative, helpful and a great listener. Christina, his assistant, is excellent in her responsiveness and courtesy. They are an excellent team and I am very grateful to have them as my providers. All of the front desk staff and x-ray technicians are equally professional, friendly and courteous. Thank you! In my opinion, Dr. Grayson is GREAT. Most importantly, he treats you like a human being and not a machine. He talks with you, explains your procedure, your actual condition and much more. His assistant, Christina, is also GREAT. Very professional, considerate and knowledgeable. Communication was so easy with Dr. Grayson and his staff. I am 83 years old and was not sure I was a candidate for surgery. He assured me that I could walk again without pain. Not only can I walk without pain but my 6 week recovery time was less and my leg was straight. Thank you, Dr. Grayson. I think you preformed a miracle. Dr. Grayson took time to answer any questions and address any concerns we had regarding my husband’s knew replacement. He uses devices that have a longstanding success rate and his procedural techniques and surgical follow up seem to be what is best for the patient and their recovery. We couldn’t be more pleased with the outcome! Thank you Dr. Grayson for your kind, considerate and compassionate manner, as well as your superior surgery skills! Everyone was just wonderful and very caring. Thank you all for helping me through this time and surgery. Thank you to Dr. Grayson and Christina. I was very impressed with Dr. Grayson and his staff. Everyone was very professional and friendly. The Physical Therapy staff was the same way and very important to my recovery. After ten weeks, I was playing golf and walking eighteen holes with no pain. My life is back to normal and I can do anything I want. I was in severe pain in both hips for five years. I made an appointment with Dr. Grayson and he assured me that he could help with my pain. I had surgery on one hip in June of 2017 then my second hip surgery took place in November. Wow, what a difference! My rehab consisted of three home sessions and my recovery period was ten days after each surgery. Dr. Grayson was very professional and caring. I highly recommend Dr. Grayson to give you your quality of life back and then some. Thank you, Dr. Grayson, for giving me my mobility back! After three surgeries with another doctor, a serious infection and a badly placed spacer, I was dropped by my doctor. His reason was that I was too great a risk. For nine months, I had been in constant pain laying in a bed in a rehab facility. I found Dr. Grayson and he told me that if I did everything he told me to do, I would be fine. After my surgery with Dr. Grayson, I had no pain and with therapy, I walked for the first time in nine months. He is a wonderful, kind and caring man who is an extremely knowledgeable, competent and skilled surgeon. I would recommend him to anyone who needs hip surgery without hesitation. I had a hip replacement performed by Dr. Grayson and I have to say that I love this man. He did such a great job! I have never had a surgery before in my life and I was scared. However, after surgery, I was back to work in just two weeks. I just had my three month checkup and everything was great! I am dancing again, thank you to Dr. Grayson for giving me my life back. What an awesome staff and an awesome Doctor, I give them twenty stars! Thank you! Before finding Florida Orthopaedic Institute, I went to several doctors trying to get relief from the extreme pain I had in my hip. All of the offices that I saw prior to Florida Orthopaedic Institute said it could be three to four months before I could even see a doctor. I was in so much pain there was not a position that was comfortable. I had to look outside the bubble, where I found Florida Orthopaedic Institute. I called and they had me in their office within a week. Dr. Grayson took one look at my x-ray and said, “You need surgery”. Christina B., Dr. Grayson’s administrative medical assistant, took my info and had me in the hospital two weeks later. I went in [very impressed by their procedure for prepping prior to surgery] on Tuesday and was back home Thursday, able to walk again. I had virtually no pain, was advised to use a walker. This took place on March 28. Now it is June 22 and I am back to riding my bike twenty miles, golfing, swimming and enjoying life. Anybody that has a joint related problem needs to see these doctors. They are wonderful. THANK YOU. Over a year ago I had an MRI done on my back because my back, left hip, and left leg were in extreme pain. I could hardly walk to the end of our driveway and back. After seeing a different orthopedic surgeon, I was told that I needed a hip replacement. I knew I had back trouble, but never realized that I needed a hip replacement. Unfortunately, that surgeon did not take the time to answer my questions and the receptionist wanted to schedule my surgery that day. I shared my concerns with my primary care physician, and he told me to go see Dr. Grayson. Dr Grayson gave my husband and I the time we needed to ask our questions. He did tell me I needed the hip replacement, but was in no hurry to schedule my surgery-he said he would do it when I’m ready, I knew that day that he was the right surgeon for me. When I did finally decide to proceed with the surgery, I called with additional questions and was put right through to Dr. Grayson. I was really not expecting to be able to speak with him so soon. His kindness and knowledge was exemplary. On the day of my surgery, Dr. Grayson took the time to see me both before and after the surgery as well as the days I spent in recovery at the hospital. Although he is a very busy doctor, I never felt that he was in a hurry to leave when I had questions. The surgery went very well. I was off pain killers four days after the surgery and off anti-inflammatory medication a week later. Within three weeks I was able to walk without a walker or cane. I just went for my one year checkup on my new hip and everything looks good. My husband and I have been able to go for a walk every day and have gone dancing on occasion. For anyone who needs hip or knee surgery, I would highly recommend Dr. Grayson. I never felt like he was just treating another patient. He treated me with compassion and care as if he were treating a family member.